All rooms in the Ambassador Hotel are pet-friendly, so bring your four-legged pal along on your next Tulsa adventure. Pack up the pooch and head to the Sooner State and you’ll soon find it’s a pet’s paradise. From spacious state parks with swim beaches and hiking trails to luxurious hotels that roll out the red carpet with top-notch pet amenities, there’s something in Oklahoma to please them all. The Skirvin Hilton Hotel in Oklahoma City is one of the few hotels that makes an overnight away from home as accommodating for pets as it does for human guests. Ensure your dog has the trip of a lifetime with the Pampered Pooch Package. An assortment of treats and biscuits will be waiting for your furry friends upon his or her arrival and they’ll have a Skirvin food and water bowl to use in their room for the duration of your visit. When your pooch grows weary of life in the big city, a plush pet bed bearing the Skirvin logo will be fluffed and ready. While in Oklahoma City, take your dog for a short jaunt across downtown to check out the Myriad Botanical Gardens. This open-air garden features beautiful walking trails leading to an enclosed dog release area. Your pet will love a romp in this dog park, which provides plenty of shade and water. For a quieter getaway with your pet, escape downtown and check in at The Grandison Inn at Maney Park in Oklahoma City. Your pup will relish the three-story home with charming features. The accommodations are ideal for pet owners seeking a quiet retreat with plenty of privacy – just note that pets left alone in guestrooms must be crated. When you get hungry, keep in mind that dogs in Oklahoma City love an outing to Louie’s Grill & Bar on Lake Hefner just as much as humans do. Not only are pets allowed on the patio here, they’re brought a bowl of water so they can relax with their owner and watch the sun set over the lake. After a long day of travel, dogs love to take a load off in their very own luxury pet bed. At the Ambassador Hotel in Tulsa, they can do just that. The hotel will also provide food and water bowls in your guestroom and a small bag of treats. If your pet has traveled to Tulsa from afar, he might enjoy stretching his legs at the city’s newest urban park, Guthrie Green. Your dog will love roaming this spacious downtown space, buzzing with activity with live performances and open air markets. Give yourself and your pooch a breather and take a seat at the Mr. Nice Guys patio. This Mexican taco restaurant features a variety of street tacos and mac & cheese in a relaxed setting. 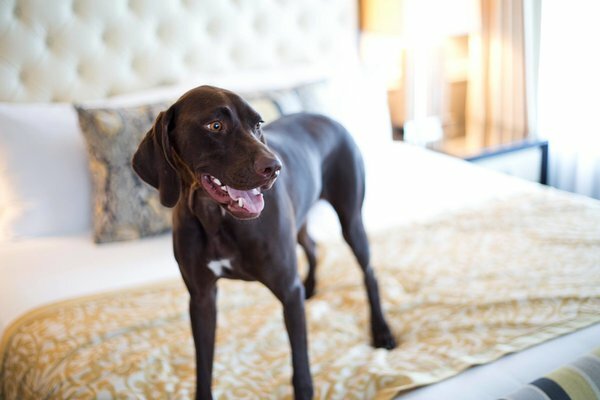 The Campbell Hotel in Tulsa provides first-class customer service and comfort for canine guests. Your pet will adore a stay at one of 26 uniquely themed and exquisitely decorated rooms at this historic hotel. During your stay, head just a couple miles south to Utica Square for some window shopping with your pooch. Enjoy a patio meal with your pet at Stonehorse Café, The Wild Fork or Queenie’s Café & Bakery while you’re there. You and your dog will fall in love with nature at Oklahoma’s oldest national park area, the Chickasaw National Recreation Area in Sulphur. A haven for nature lovers, this park welcomes dogs on leashes and has several camping options. Six public campgrounds hold more than 400 individual campsites and the area is joined with the Lake of the Arbuckles, offering plenty of scenic, lakeside photo-ops along the peaceful shoreline. Your pet will love water recreation and trail hiking during the day followed by serene camping at night. The Chickasaw National Recreation Area is open year-round to outdoor enthusiasts and campers. Dogs will likely catch a glimpse of a beaver building a dam or a bison grazing on the prairie while hiking more than 20 miles of trails. With crystal clear waters and towering pine trees, Broken Bow is a paradise for pets. Beavers Bend Creative Escapes has more than 20 cabins that welcome pets. All of them feature spacious decks perfect for enjoying your morning coffee with your best canine pal by your side. Five Star Cabins in Broken Bow boasts a handful of pet friendly cabins ideal for dog owners who plan to do a little exploring without their pups. The Lucky Star and Rising Star cabins both have outdoor kennels to keep dogs happy and safe while their owners are away. The area is packed with fun activities, but with on-site amenities like hot tubs, fully stocked kitchens, charcoal grills and board games, you may never want to venture outside your cabin. Pets adore exploring the more than 100 miles of shoreline surrounding beautiful Hugo Lake at Hugo Lake State Park. After a long day of exploring, you and your pooch will love settling down in one of the state park’s beautiful cabins. Pets of all sizes are welcome in the cabins here, and you can choose between primitive cabins or resort cabins with full kitchens. All feature fireplaces perfect for warming you and your pup each evening and waterfront decks ideal for viewing wildlife. After a good night’s rest, you and your four-legged companion can stretch your legs with a hike through the park. Pampered pooches love staying in a comfy, furnished cabin, but your nature-loving dog might prefer a night under the stars at one of Greenleaf State Park’s campsites. Eagles Nest tent campground at this state park in Braggs features beautiful views of the lake and is scattered with plenty of shade trees. Greenleaf boasts a few RV camping areas, as well, for dogs traveling by trailer. Pull on your walking shoes and grab the leash for a long walk along the gorgeous paved trail that ends with a breathtaking overlook at the water’s edge. Wind your way through mossy boulders and you might even see a wild turkey or deer. For dogs who love a challenge, stay overnight at Mary’s Cove Primitive Campground. Located five miles into the park’s walking trail, this isolated and serene campground is a fun adventure for canines and humans alike. Your dog will dig the views at the Quartz Mountain Resort, Arts & Conference Center in Lone Wolf. Situated between the beautiful Wichita Mountains and serene Lake Altus-Lugert, Quartz Mountain is a paradise for you and your pets. Enjoy hiking, eagle watching, cave exploring and bass and trout fishing without ever leaving the resort. With each guestroom featuring its own porch, you and your pet both will love the convenience of having direct outdoor access.